The taxpayers of the United States have poured trillions of dollars into our public education system. Unfortunately, test scores are not rising. The U.S. now spends $500 Billion a year on education and that is only increasing. 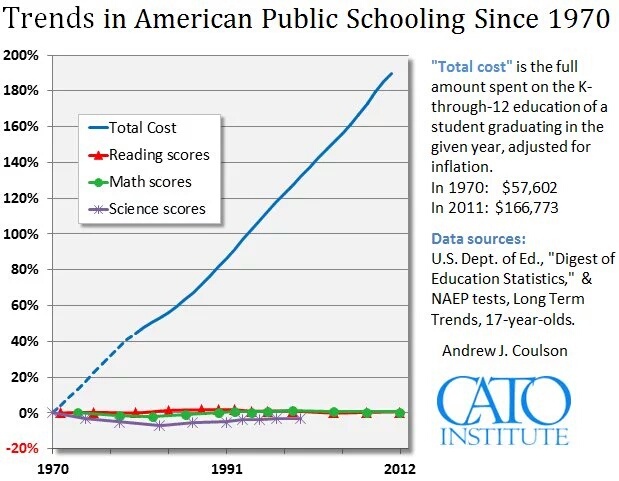 Cato Institute showed an interesting graph showing 50 years of data correlated to spending and test scores. You can read the full article here. It’s factually obvious the U.S. needs to restructure the education system away from the current cartel setting.